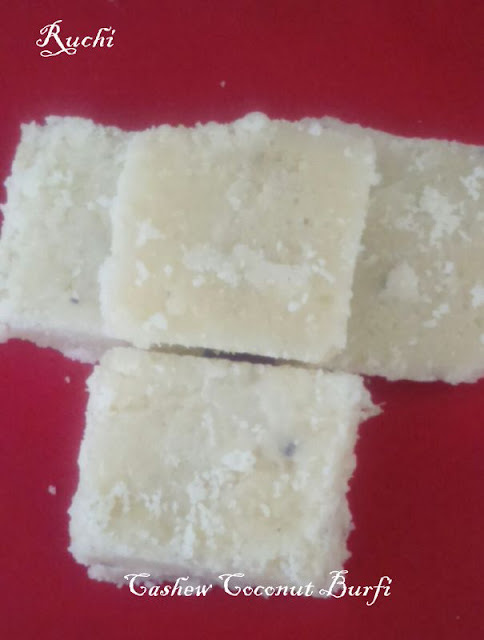 After a break i am back again to celebrate, my daughter's marriage with a sweet recipe. . Thengai Burfi or coconut burfi is One of the very popular Indian traditional sweet& one of the easiest burfis. It is quite easy to prepare at home as it requires very few ingredients. The taste and the juices that derive from the fresh coconut give the special richness to this delicacy. The cashew nuts add to the taste and richness. 1.Soak the cashews in the milk for 1hour. Grate the coconut.Then Grind the cashews with the milk along with scrapped coconut into a smooth paste. 2.Grease a plate and keep aside. Heat a heavy bottomed Kadai add sugar and water mix well till sugar dissolves completely and starts bubbling. Keep stirring continuously, cook till a single string consistency. 3.At this stage add the cashew coconut paste, sugar and ghee. Mix well. Keep stirring continuously on medium flame. 4.Combine and keep stirring till bubbles star forming at the edges. the whole thing will start leaving the sides and start frothing up. Keep stirring, At this stage add ghee. 5.The whole mixture will come together and it will start thickening and form a mass without sticking and starts coming off easily from the sides of the pan . 6. At this stage add cardamom powder and give a quick stir. Immediately pour into a greased plate. Cool and cut into pieces when slightly warm then store it in airtight container.